Our next workshop is on Monday, February 25, 2019 from 12::30 to 3:30 at 1446 Bloor St West. POSTPONED TO THURSDAY MARCH 28TH DUE TO THE BLIZZARD! Our workshops maximize learning for individuals, schools, day camps and corporate groups. Monthly workshops are no longer available and online courses are in production. Fees are available on the pre-registration page for one of the formats below. About faceART101: Learn advanced techniques used in many of our portfolio designs and albums. HOSTING A WORKSHOP: Hosting faceART 101 happens at your location. A minimum of 3 participants is required. WORKSHOPS: A 3 hour booking to teach employees techniques and skills for use at home or work. A 10% discount applies for not-for-profit organizations. SCHOOLS, DAY CAMPS: To manage a large number of participants, a full day from 9am to 3pm is typically booked. The day is divided into 40 minute classes before and after lunch to make the content available to as many students of all ages as required. The format can also be customized to suit your needs. Tell us more on the pre-registration page. faceART201: Tailored to anyone who has completed faceART 101 or has industry experience and wants to learn best practices to start their own business. This course is in production for online learning only. Xan Lazaridis is a fine artist with 30 years experience in the entertainment industry. Her work has appeared in magazines and television, including CBC and Georgian Bay Life. 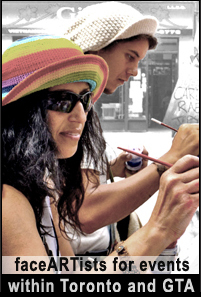 Her work is in high demand for corporate events, birthday parties, street festivals and community events. She brings her passion and knowledge to the classroom and ensures a positive learning experience for students. View past workshop photos and videos. When planning an event that needs a costume, such as a Halloween or theme party for your child, disguises for kids are top of mind - and face. As parents know, Halloween costumes can be expensive, especially considering that the costume may not fit the following year. 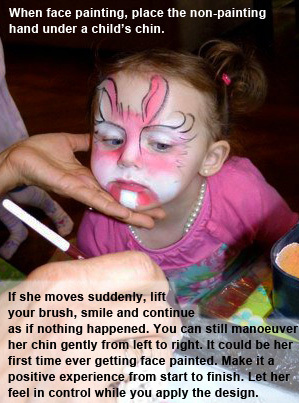 As a fun and inexpensive alternative, consider face painting for kids. Our affordable workshops explore the tips below in detail and give you many skills to take home. With practice, you will have the confidence to paint up the kids for Halloween or any other occasion. Kids Face Painting is fun and easy, best achieved by starting off with simple face painting designs. Visit our online store and choose from single colours in various sizes or palettes of 12 or 24 colours. Start with 3 to 12 colours depending on the size of the paints and your face painting budget. Be sure to use quality water based face paints for best results. The ingredients in our paints are meant for human skin and meet rigorous ECARF standards. Various sizes are available in many colours through our online store at the best prices. There are many brands out there, including Snazaroo (available at art stores). Kryolan is one of the brands that is safe for all skin types and the only product used by faceART. Apply it on clean skin and a little goes a long way. The colours are vibrant and do not dry out the skin. Beauty supply stores can be of help, but they may have limited stock depending on the season. We sell Kryolan face paints, sponges and specialty face painting items in our store at affordable prices. Non-latex makeup sponges cut in half are very useful for blotting on background colours. Purchase them here starting at $1 each. Sponges are a versatile, reusable face painting tool for creating soft or hard edges. Use both ends of the sponge for applying and blending multiple colours. different colours. Reuse all your face painting tools after washing in plain soap and water and leaving to air dry. To protect and extend the life of your brushes, use a brush cleaner and preserver. Visit our online store for Kryolan face paints and accessories at affordable prices. 1 - Paint, sponge or brush the main colours first. Sponges are best for lightly covering the face. 2- Thin black outlines applied with your #4 brush are most effective for defining a design, like a colouring book. A suggestive outline is best. 3 - Loading the brush: Load just enough paint on your brush without overflowing. 4 - Double-loading: To apply a line onto the child’s face, load two colours onto your brush to create pleasing highlights and save time. Avoid mixing the two colours on the brush. Load one colour onto the brush, then less of a second colour onto the tip. Highlight colours can be black or white. Other good colours to load sit close to each other on the colour wheel, like Red/Yellow, Blue/Purple, and Green/Blue. Experiment with light/dark shades and shades of similar value. When you feel the tip colour running out, load a bit on again and continue where you left off. 5 - Children often like to talk about their favorite designs. Having a conversation with them will give you ideas and encourage them to stay involved and enjoy the experience. 6 - Study and practice designs on your own time, including popular characters. Taking digital pictures is an excellent way to build a face painting reference file. 7 - Give yourself a time limit. If you think a particular design will take 10 minutes to complete, give yourself 5 minutes to complete it. The result will be a fresher, more spontaneous design that will be easier to reproduce. 8 - Use a small spray bottle with water to keep your paint creamy and useable. Or, use a clean sponge to squeeze a few drops of water across your paints when needed. 9 - Eye makeup applicators, the ones with little handles on them, are inexpensive solutions for dotting flower centres and leopard spots onto a dry background colour. 10 - Rinse or wipe brushes before each use. Never leave brushes in water. Use an empty container to rest brushes upright. To further extend brush life, dip brushes in par-boiled water as soon as the bristles start to stay separate, even when dry. Synthetic fibres have memory and this action restores the bristles to their original position. Avoid pulling stray fibres out. For that occasional run away bristle, bend the bristle right down to the heel of the ferrule (the part of the brush that holds the bristles in place), press a penny against the heel and shave the stray bristle away. This keeps the heel full with the original bristles and prevents excess water from getting into the ferrule. 11 - Remember you're creating memories for you and your guest. Uphold your intention to make them happy and positive memories. 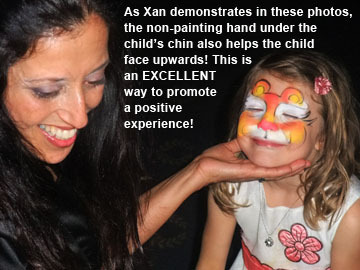 A pleasant face painting experience can last a lifetime. 12 - Now that you know what to do with your brushes, sponges and paints, what do you do with your hands? Avoid holding the top of children's heads. It's harsh and interferes with alignment. Let children maintain access to the world around them by positioning your non-painting hand under their chin. Subtle handling showcases the child in pictures and makes you look more respectful towards your guest. 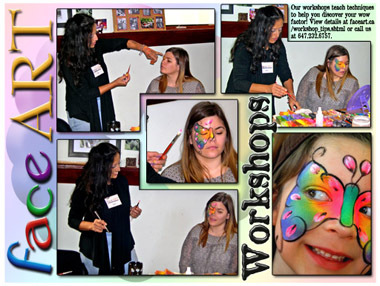 About Us: faceART provides face painting in Toronto and surrounding areas including North York, Etobicoke, Mississauga, Brampton, Scarborough and the Greater Toronto Area. We promise to make a memorable impression at your next event or party. For bookings, call or email us today.